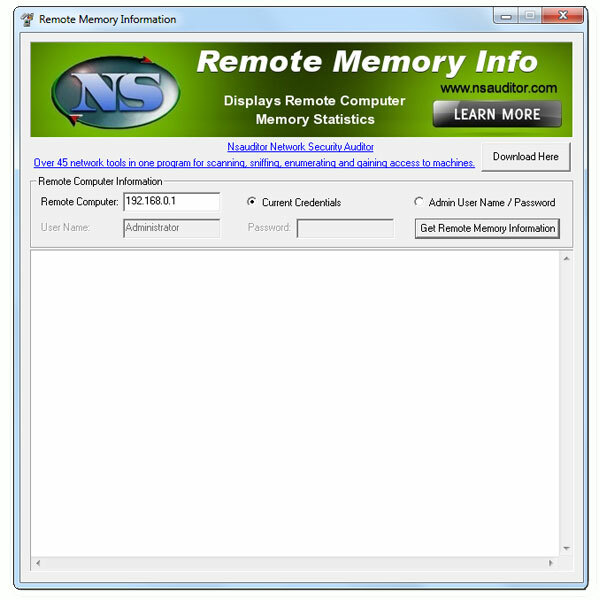 RemoteMemoryInfo displays remote network computer memory usage and statistics, Page Faults/sec, Available Bytes, Committed Bytes, Commit Limit, Write Copies/sec, Transition Faults/sec, Cache Faults/sec, Demand Zero Faults/sec, Pages/sec, Pages Input/sec, Page Reads/sec, Pages Output/sec, Pool Paged Bytes, Pool Nonpaged Bytes, Page Writes/sec, Pool Paged Allocs, Pool Nonpaged Allocs, Free System Page Table Entries, Cache Bytes, Cache Bytes Peak, Pool Paged Resident Bytes, System Code Total Bytes, System Code Resident Bytes, System Driver Total Bytes, System Driver Resident Bytes, System Cache Resident Bytes, Committed Bytes In Use, Available KBytes, Available MBytes. You must have administrative privileges on the remote network computer. All the mentioned features are provided with a user friendly graphical interface.